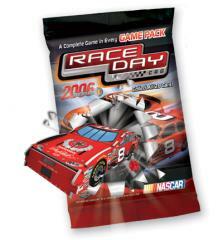 Construct your car and “stand on it” all the way to the checkered flag in Race Day™ 2006, the action-packed constructible racing game from WizKids®! Two to eight players build 3-D race cars out of plastic card components and compete in this fast-paced game. The first series of 2006 includes 30 cards to collect, each with its own unique statistics and abilities, including Dale Earnhardt, Jr., in the No. 8 Chevrolet and Jeff Gordon in the No. 24 DuPont Chevrolet. One lucky consumer will win a NASCAR-fan’s Dream Trip for four to the Pennsylvania 500 at Pocono Raceway in July! Best of all, everything two people need to play comes in one low-priced Game Pack, including two randomly inserted race cars, one resource card, rules, a die, and a racetrack play mat! Each 36 count display comes with a clear bubble with 4 pre-assembled race cars.